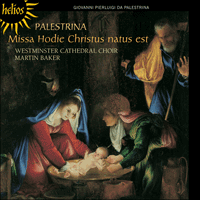 Martin Baker’s recordings of Palestrina with Westminster Cathedral Choir have been highly praised across the world. Here is a sumptuous recording of works dedicated to the festival of Christmas, the main work being the stunning Missa Hodie Christus natus est—one of Palestrina’s most popular works. This is music of great devotional beauty, all sung with Westminster Cathedral Choir’s customary finesse and atmospheric reverence. Giovanni Pierluigi da Palestrina is thought to have been born in 1525 in the town of that name in the Sabine hills near Rome, and he died in Rome on 2 February 1594. His first musical training seems to have been in Rome at S Maria Maggiore, where he was listed as a choirboy in October 1537. In October 1544 he was appointed organist at the Cathedral of S Agapito in Palestrina, where he remained until his appointment in 1551 as Maestro of the Cappella Giulia at St Peter’s in Rome. In 1554 Palestrina published his first book of Masses, dedicated to Pope Julius III. In January 1555 he was admitted to the Cappella Sistina, the Pope’s official chapel, on the orders of the Pope, without examination and despite being married. Three months later Julius III died and was succeeded by Marcellus II, who in turn died within about three weeks. The next Pope, Paul IV, insisted on full compliance with the chapel’s rule on the celibacy of its members and Palestrina, who had married in 1547 during his stay at Palestrina, and two others were dismissed from the choir in September 1555. In the following month Palestrina was appointed Maestro di cappella at St John Lateran where he stayed until he left in 1560 following a dispute with the chapter over the financing of the musicians. His next known employment was again at S Maria Maggiore in 1564, where he passed the next five years combining this post with work for Cardinal Ippolito II d’Este. The latter work he continued on a more or less full-time basis until 1571, during which time he also taught music at the Seminario Romano. In April 1571 he took up his last appointment, returning to the post of Maestro of the Cappella Giulia, where he remained until his death. This recording is devoted to a selection of Palestrina’s music for Advent and Christmas. The church year is divided into four liturgical periods. The first, including Advent, Christmas and the post-Christmas time up to Septuagesima, centres on the Nativity of Christ; the second, Septuagesima Time (which begins with Septuagesima Sunday, the ninth before Easter, and includes Lent) leads up to Easter; the third, Paschal Time, extends from Easter to Pentecost (Whitsun); and the fourth, beginning on Trinity Sunday, comprises the rest of the year. Advent thus stands at the beginning of the church year and is a period of preparation for the coming (in Latin, adventus) of Christ and leading up to the celebration of his birth on Christmas Day. Like Christmas, it has a rich liturgy and Palestrina provided much music for both seasons. Alma redemptoris mater is a text of considerable antiquity and appears in several thirteenth-century motets. In the Roman liturgy it is an antiphon to the Blessed Virgin Mary, which is sung during Advent and until the Feast of the Purification. Palestrina made three settings of this text, a paribus vocibus setting for four high voices, which was included in his second book of four-part motets published in Venice in 1596, and two eight-part settings, which were not issued in printed editions in Palestrina’s lifetime. These were later transcribed by Haberl in the nineteenth century from manuscripts then in the archives of the Cappella Giulia and of the Collegium Romanum. The version sung here is the Cappella Giulia setting, which is written in a fuller and more polyphonic style than the other and, with its constantly changing textures and rich sonorities, achieves a great sense of strength and spaciousness. Canite tuba is a motet for the fourth Sunday of Advent. The first part of this five-voice motet draws its text from the first and third antiphons at Vespers; and the second part, ‘Rorate caeli desuper’, takes its text from the Introit at Mass on the fourth Sunday of Advent, combined with text from the First Responsory of the Ordinary of Advent and its first verse. The motet was first published in Venice in 1572 in Palestrina’s second book of motets for five, six and eight voices. As befits its opening words, ‘Sound the trumpet in Sion, for the day of the Lord is nigh’, the motet begins strongly in an extrovert manner, turning to a more reflective and polyphonic style at the words ‘come, O Lord, and be not tardy’, and ending the first part with an expressive outpouring of joyous Alleluias. The second half begins more quietly with a reduced voice section, but soon reverts to vigorous five-part writing which comes to a dramatic pause at a section headed ‘Show us thy mercy, O Lord, and grant us thy salvation’. This is followed by a more polyphonic section, expressing beautifully the pleading tone of the words ‘come, O Lord, and be not tardy’, which uses and elaborates on material from the similar section in the first part. The motet concludes with another joyful burst of Alleluias, the musical material from the end of the first part being slightly reworked. Deus tu conversus is the Offertory at Mass on the Second Sunday of Advent. This five-voice setting comes from a cycle of Offertories published in Rome in two volumes late in Palestrina’s life by Francis Coates, in 1593, which contain some fine music in a polished and mature style exhibiting much rhythmic vivacity and unusual harmonic richness. The motet opens with a stately invocation, ‘Turn unto us, O God’, and quickly moves to cascades of running semiquavers at the words ‘and quicken us’. The next section uses dotted figures and vigorous rhythms to convey the sense of ‘and thy people shall rejoice’, but this is soon cut short by the opening of a slow-moving homophonic penitential passage (very similar to that in Canite tuba) at the words ‘Show us thy mercy, O Lord’, which nonetheless comes to a strong finish at the words ‘and grant us thy salvation’. After a half-bar pause the whole of this final section is repeated and concludes the motet on a buoyant note. Hodie Christus natus est is a double choir (SSAB+ATTB) motet that comes from Palestrina’s third volume of motets published in Venice in 1575. The motet is based on the text of the Magnificat antiphon at Second Vespers on Christmas Day, interspersed with the traditional Christmas cries of ‘noe, noe’. This is a wonderful piece of writing which brilliantly exploits the possibilities of effective contrast: by using the differing sonorities of a high choir and a low choir; by setting off slow-moving passages expressing the solemnity of the celebration of Christ’s birth against rapid antiphonal exchanges of joyful cries of ‘noe, noe’; by using running passages to reflect the singing of the angels and the rejoicing of the archangels and the just; and by reserving until the concluding section of the motet the use of triple time for the final joyful exchanges of ‘noe’. Palestrina’s double-choir Missa Hodie Christus natus est is a parody Mass closely based on the motet just described. It uses all the techniques noted above which give the motet such a brilliant and striking character and, while the precise use made of the musical material of the motet varies from one movement to another, the Mass bears the imprint of the motet in all its movements. The Kyrie opens with an exact quotation (with the soprano lines exchanging parts) of the opening bars of the motet, and much of the opening ‘noe, noe’ material is re-used in slightly adapted form. In other places the material from the motet, often recognizable from its harmonic sequence, is used more loosely and is more considerably adapted and combined with other new material; but in others it is used with much less alteration. For example, all movements of the Mass apart from the Agnus Dei end with a use in the final section, with only minor amendments, of the almost boisterous triple-time last section of the motet. The result is an impressive Mass which exhibits all the excitement, clarity and sparkle of its model together with a certain sense of breadth and grandeur. O magnum mysterium is a motet for the Nativity of Our Lord, which takes its text from the first half of the fourth and third Responsories at Matins on Christmas Day. It was included in a collection of motets, for five, six and seven voices, published in Rome in 1569. This exquisite six-part motet conveys superbly the awe and joy of the shepherds at the birth of Christ in a manger. Opening with a series of slow chords announcing the ‘great mystery and wonderful sacrament’, the music proceeds in a mainly homophonic idiom, with differing and well calculated combinations of voices, until it breaks into a lively triple time to represent the ‘chorus of angels praising God’, returning to duple time for a final section of pealing Alleluias; the second half has a similar structure and re-uses some of the material from the first half to very good effect. Tui sunt caeli is the Offertory (also from the 1593 publication) from the Third Mass of Christmas. This five-part motet is written in a flowing fugal manner with periodic short homophonic interjections which contrast effectively with the prevailing polyphonic style and prepare the way for a satisfying end to the piece. O admirabile commercium is a five-part motet for the Feast of the Circumcision (which falls on January 1st) and the Octave of the Nativity. It takes its text from the first antiphon at Second Vespers of that Feast. The motet comes from a collection entitled Florilegium sacrarum cantionum published by Phalèse in Antwerp in 1602. The still and poised music of its opening bars—‘O wonderful gift’—sets the tone for the rest of this beautiful and finely balanced motet which makes very good use of a high cantus part soaring slowly over the more busy music of the other parts in the final section. The Magnificat primi toni is a composition which comes from Palestrina’s third volume of Magnificats. It is, like most of his Magnificats, written in the alternatim style, but, unlike many of them, it employs up to six voices. Its style is mainly polyphonic and fugal and has a rich texture, but variety is obtained by using different combinations of high and low voices and in places a lighter texture. The Magnificat is preceded and followed by its plainsong antiphon ‘Hodie Christus natus est’, on which, as explained above, the double-choir motet and the Mass are based. Giovanni Pierluigi da Palestrina serait né en 1525 dans la ville du même nom, en Sabine, près de Rome et mourut le 2 février 1594. Il reçoit apparemment son premier enseignement musical à Rome dans les chœurs de Sainte-Marie-Majeure, où il entre comme choriste en octobre 1537. En octobre 1544 il est nommé organiste de la cathédrale S. Agapito de Palestrina, où il reste jusqu’à sa nomination, en 1551, au poste de Maître de chapelle à la Cappella Giulia de Saint-Pierre de Rome. En 1554, Palestrina publie son premier livre de messes, dédié au Pape Jules III. En janvier 1555, il est admis à la Chapelle Sixtine, chapelle officielle du Pape, sur les ordres de ce dernier, sans examen et malgré le fait qu’il soit marié. Trois mois plus tard, Jules III décède et c’est Marcel II qui lui succède pour mourir à son tour trois semaines plus tard. Le Pape suivant, Paul IV, insiste sur le strict respect des règles de la chapelle et le célibat de ses membres. Palestrina qui est marié depuis 1547 et deux autres musiciens sont renvoyés des chœurs en septembre 1555. Le mois suivant, Palestrina est nommé Maître de chapelle à la basilique Saint-Jean-de-Latran où il demeurera jusqu’en 1560, date à laquelle il partira suite à un profond désaccord avec le chapitre sur le financement des musiciens. On le retrouve quatre ans plus tard, en 1564, de retour à Sainte-Marie-Majeure où il combine, pendant les cinq années qui suivent, son rôle de Maître de chapelle avec les fonctions qu’il occupe auprès du Cardinal Hippolyte II d’Este. Il conserve ces fonctions plus ou moins à temps complet jusqu’en 1571 et, dans le même temps, enseigne la musique au Seminario Romano. En avril 1571, il reprend son précédent poste à la Cappella Giulia où il reste jusqu’à sa mort. Cet enregistrement est consacré à une sélection de la musique de Palestrina pour l’Avent et Noël. L’année liturgique se divise en quatre grandes périodes: la première, le temps de l’Avent et le temps de Noël-Épiphanie, est centrée sur la naissance du Christ; la deuxième, celle du temps ordinaire et du Carême (du 2e au 7e dimanche puis du mercredi des Cendres au dimanche des Rameaux et à la Semaine Sainte) mène à Pâques; la troisième comprend le temps Pascal et s’étend de Pâques à la Pentecôte; et la quatrième part du dimanche de la Sainte Trinité et couvre le reste de l’année jusqu’à l’Avent suivant. L’Avent est donc un nouveau commencement pour l’Église et un temps de préparation pour la venue du Christ (d’où le nom «Avent», du latin adventus) et la célébration de sa Nativité le jour de Noël. À l’instar de Noël, la liturgie de l’Avent est particulièrement riche et Palestrina ne manque pas d’écrire une musique importante pour ces deux périodes. Alma redemptoris mater est un texte extrêmement ancien qui apparaît dans de nombreux motets du 13e siècle. Dans la liturgie catholique romaine, il s’agit d’une antienne à la Vierge Marie, qui se chante au temps de l’Avent et jusqu’à la Fête de la Purification. Palestrina composera trois arrangements pour ce texte: un paribus vocibus pour quatre voix aiguës, inclus à son deuxième recueil de motets à quatre voix et publié à Venise en 1596, et deux arrangements à huit voix, qui ne furent pas publiés du vivant du compositeur. Ils seront ultérieurement transcrits par Haberl au 19e siècle à partir de manuscrits des archives de la Cappella Giulia et du Collegium Romanum. La version chantée ici est celle de la Cappella Giulia. Écrite dans un style plus riche et plus polyphonique que l’autre version, elle constitue une mosaïque de textures et de sonorités et donne un sentiment de grande force et d’espace. Canite tuba est un motet pour le quatrième dimanche de l’Avent. La première partie de ce morceau pour cinq voix tire son texte de la première et de la troisième antienne des Vêpres; la seconde partie, «Rorate caeli desuper», allie l’introït de la messe du quatrième dimanche de l’Avent au premier répons de l’ordinaire de l’Avent ainsi que son premier couplet. Ce motet est publié pour la première fois à Venise en 1572 dans le deuxième livre de motets pour cinq, six et huit voix. Comme il sied au texte de l’ouverture «Sonnez, trompettes de Sion, car il est proche le jour du Seigneur», le motet démarre avec force et assurance extravertie pour adopter un style plus réfléchi et polyphonique sur les mots «viens, Seigneur, et ne tarde plus» puis conclut la première partie avec une effusion expressive de joyeux Alléluias. La seconde partie commence plus doucement par une section au nombre de voix réduit mais revient vite à l’écriture vigoureuse à cinq voix pour marquer une pause dramatique sur les mots «Aie pitié de nous Seigneur et donne-nous le salut». S’ensuit une section plus polyphonique qui exprime avec beauté le ton suppliant du motif «viens, Seigneur, et ne tarde plus» qui utilise et développe la section similaire figurant dans la première partie. Le motet se conclut sur une nouvelle explosion joyeuse d’Alléluias qui reprennent légèrement les motifs de la fin de la première partie. Deus tu conversus est l’offertoire de la messe du deuxième dimanche de l’Avent. Cet arrangement pour cinq voix provient d’un cycle d’offertoires publiés à Rome en deux volumes relativement tard dans la vie de Palestrina, par Francis Coates en 1593. Ces deux volumes contiennent une musique superbe dans un style lissé et mûr, démontrant une grande vivacité musicale et une richesse harmonique inhabituelle. Ce motet s’ouvre par une invocation solennelle: «Dieu tourne-toi vers nous» pour évoluer rapidement en cascades de demi-croches sur les mots «et donne-nous la vie». La section suivante utilise des notes pointées et des rythmes vigoureux pour transmettre le sens de la phrase «et ton peuple se réjouira». Mais cette énergie est rapidement calmée par l’ouverture d’un passage pénitentiel homophonique et lent (très similaire à celui du Canite tuba) sur les mots «Prends pitié de nous, Seigneur» qui n’en finit pas moins en force par «et donne-nous le salut». Après une pause d’une demi-mesure, cette section finale est répétée et conclut le motet sur une note enjouée. Hodie Christus natus est est un motet écrit pour deux chœurs (SSAB+ATTB) qui se trouve dans le troisième volume de motets de Palestrina, publié à Venise en 1575. Il se fonde sur l’antienne du Magnificat aux Secondes Vêpres du jour de Noël pour y mêler les cris traditionnels de Noël, «noe, noe». Il s’agit là d’un morceau à l’écriture merveilleuse qui exploite avec brio les possibilités d’un contraste efficace: en utilisant les différences de sonorités entre le chœur aigu et le chœur grave; en marquant des passages lents exprimant la solennité de la naissance du Christ sur fond d’échanges rapides de cris joyeux, «noe, noe»; par la fluidité des passages décrivant les chants des anges et la joie des archanges et des justes; et en réservant à la conclusion du motet l’utilisation de la mesure à trois temps pour un échange plein d’allégresse de «noe» triomphants. Le Missa Hodie Christus natus est de Palestrina pour deux chœurs à quatre voix est une messe imitant le motet décrit ci-dessus. Elle a recours à toutes les techniques notées plus haut, qui donnent au motet sa personnalité exceptionnelle, et varie l’utilisation exacte des motifs musicaux du motet d’un mouvement à l’autre, si bien que la messe tout entière porte la marque du motet. Le Kyrie s’ouvre sur une citation exacte (dans l’échange des soprano) des mesures d’ouverture du motet, et les «noe, noe» du début sont réutilisés dans une forme légèrement adaptée. À d’autres endroits, les motifs du motet, souvent reconnaissables par leur séquence harmonique, son utilisés plus librement et sont plus largement adaptés et alliés à d’autres motifs; mais par endroits, le motet est repris beaucoup plus directement. Tous les mouvements de la messe, par exemple, à l’exception de l’Agnus Dei, se terminent par l’utilisation (avec des changements mineurs) de la dernière section presque tumultueuse à trois temps du motet. Le résultat? Une messe impressionnante qui expose toute la joie, la clarté et le brio de son modèle avec un certain sens de grandeur et d’ampleur. O magnum mysterium est un motet pour la Nativité qui prend son texte de la première moitié des quatrième et troisième répons des Matines du jour de Noël. Il figure dans une collection de motets pour cinq, six et sept voix, publiée à Rome en 1569. Ce magnifique motet pour six voix transmet toute la joie et l’admiration des bergers à la découverte du Christ dans l’étable. Sur une ouverture aux accords lents annonçant «le grand mystère et le merveilleux sacrement» la musique évolue vers un langage homophonique aux combinaisons de voix variées, bien calculées, pour se lancer dans une mesure animée à trois temps représentant «le chœur des anges chantant la louange de Dieu» et revenir à deux temps pour une section finale d’Alléluias carillonnants: la seconde partie présente une structure similaire et utilise très intelligemment certains motifs de la première moitié. Tui sunt caeli est l’offertoire (figurant également dans la publication de 1593) de la troisième messe de Noël. Ce motet pour cinq voix est écrit à la manière d’une fugue avec de brèves interjections homophoniques offrant un contraste plein d’effet avec le style polyphonique principal et préparant l’auditeur à la fin superbe du morceau. O admirabile commercium est un motet pour cinq voix pour la Fête de la Circoncision (qui tombe le 1er janvier) et l’Octave de la Nativité. Son texte appartient à la première antienne des Secondes Vêpres de cette Fête. Le motet provient d’un recueil intitulé Florilegium sacrarum cantionum publié par Phalèse à Anvers en 1602. La musique calme et posée des premières mesures, «Ô don merveilleux», donne le ton de cet ensemble de toute beauté à l’équilibre parfait qui met superbement en valeur la voix du cantor montant lentement au-dessus des entrelacs des autres voix dans la section finale. Le Magnificat primi toni est une composition provenant du troisième volume de magnificats par Palestrina. Il s’agit, comme la plupart de ses magnificats, d’une pièce écrite dans le style alternatim, mais employant (c’est là son originalité) jusqu’à six voix. Son style est principalement polyphonique et fugué et riche de texture, mais la variété de la pièce provient des différentes combinaisons de voix aiguës et graves par endroit, lui conférant ainsi une texture plus légère. Le Magnificat est précédé et suivi par son antienne «Hodie Christus natus est», sur lequel se fondent, comme nous l’expliquons plus haut, le motet pour deux chœurs et la messe. Giovanni Pierluigi da Palestrina ist wahrscheinlich in der gleichnamigen Stadt, die in den Sabiner Bergen in der Nähe von Rom gelegen ist, im Jahre 1525 geboren. Er starb in Rom am 2. Februar 1594. Seine erste musikalische Ausbildung scheint er in Rom an der S. Maria Maggiore erhalten zu haben, wo er im Oktober 1537 als Chorknabe verzeichnet war. Im Oktober 1544 über­nahm er das Amt des Organisten an der Kathedrale von S. Agapito in Palestrina und blieb dort, bis er 1551 zum Maestro der Cappella Giulia von St. Peter in Rom ernannt wurde. 1554 gab Palestrina sein erstes Messen­buch heraus, das Papst Julius III. gewidmet ist. Im Januar 1555 wurde er auf das Geheiß des Papstes hin—ohne sich vorher einer Prüfung unterziehen zu müssen und obwohl er verheiratet war—zur Cappella Sistina, der offiziellen päpstlichen Kapelle, zugelassen. Drei Monate später starb Julius III. Sein Nachfolger, Marcellus II., blieb nicht lange im Amt: Nach etwa drei Wochen starb auch er. Der nächste Papst, Paul IV., bestand darauf, dass die Mitglieder der Kapelle die Zölibatsregel einhielten, so dass Palestrina, der während seines Aufenthalts in Palestrina im Jahre 1547 geheiratet hatte, und zwei weitere Mitglieder der Kapelle im September 1555 aus dem Chor entlassen wurden. In dem Monat darauf wurde Palestrina zum Maestro di cappella von S. Giovanni in Laterano ernannt, wo er einige Jahre tätig war, bis er 1560 nach einem Streit über die Bezahlung der Musiker den Posten verließ. Seine nächste—überlieferte—Anstellung war wiederum in S. Maria Maggiore ab 1564. Hier war er für die nächsten fünf Jahre tätig und stand gleichzeitig im Dienst des Kardinals Ippolito d’Este. Außerdem gab er am Seminario Romano Musik­unter­richt. Im April 1571 trat er seine letzte Anstellung an und kehrte zur Cappella Giulia zurück, wo er bis zu seinem Tod als Maestro tätig war. Die vorliegende Aufnahme ist einer Auswahl von Palestrinas Musik für die Advents- und Weihnachtszeit gewidmet. Das Kirchenjahr ist in vier liturgische Perioden unterteilt. In der ersten, die im Advent beginnt und bis Septuagesima geht, steht die Geburt Christi im Mittel­punkt. Die zweite beginnt mit Septuagesima (der neunte Sonntag vor Ostern) und geht bis Ostern; die dritte reicht von Ostern bis Pfingsten; die vierte beginnt mit dem Trinitatisfest und umfasst das restliche Jahr. Der Advent steht also am Anfang des Kirchenjahres und ist eine Zeit der Vorbereitung (Latein: adventus) auf das Erscheinen Christi und führt schließlich zum Weihnachtsfest hin. Ebenso wie Weihnachten hat auch die Adventszeit eine reiche Liturgie und Palestrina hat für beide Perioden viel Musik geschrieben. Alma redemptoris mater ist ein recht alter Text: Er erscheint bereits in einigen Motetten des 13. Jahrhunderts. In der römischen Liturgie ist er eine Antiphon der Heiligen Jungfrau Maria, die während der Adventszeit und zum Purifikationsfest gesungen wird. Palestrina fertigte drei Vertonungen dieses Textes an: Eine paribus vocibus-Vertonung für vier hohe Stimmen, die in seinem zweiten Buch mit vierstimmigen Motetten (erschienen in Venedig, 1596) zu finden ist, und zwei achtstimmige Versionen, die jedoch zu Palestrinas Lebzeiten nicht im Druck erschienen. Erst im 19. Jahrhundert wurden die Manuskripte, die zu dem Zeitpunkt in den Archiven der Cappella Giulia und des Collegium Romanum aufbewahrt wurden, von Haberl transkribiert. Die hier zu hörende Vertonung ist die aus der Cappella Giulia, deren polyphoner Satz noch ausgearbeiteter ist als in der anderen. Durch die enorme Klangfülle und die sich stets ändernde Textur entsteht ein Eindruck von Geräumigkeit und Kraft. Canite tuba ist eine Motette für den vierten Advent. Der erste Teil dieser fünf­stimmigen Motette stammt aus der ersten und dritten Vesperantiphon, während der Text des zweiten Teils, „Rorate caeli desuper“, aus dem Introitus der Messe des vierten Advents und dem ersten Responsorium des Adventsordinariums stammt. Die Motette ist erstmals in Palestrinas zweiten Buch für fünf, sechs und acht Stimmen in Venedig im Jahre 1572 erschienen. Die Motette beginnt auf sehr extravertierte Art und Weise, passend zu dem ersten Satz „Lasst die Trompete in Zion erschallen, da der Tag des Herrn nahe ist“. Bei den Worten „komm, o Herr, und verspäte dich nicht“ wird die Musik nachdenklicher und polyphoner, bevor der erste Teil mit expressiven, fröhlichen Alleluias endet. Der Anfang des zweiten Teils beginnt etwas ruhiger und mit weniger Stimmen, kehrt dann jedoch schnell zu einer lebhaften Fünfstimmigkeit zurück, bis bei den Worten „Zeig uns deine Barmherzigkeit, o Herr, und gib uns deine Gnade“ eine dramatische Pause erfolgt. Darauf folgt eine polyphonere Passage, in der die bittenden Worte „komm, o Herr, und verspäte dich nicht“ wunderschön ausgedrückt werden und deren Material an den ersten Teil erinnert. Die Motette schließt mit einem weiteren Schwall von fröhlichen Alleluias, wobei wiederum das musikalische Material des Schlusses des ersten Teils aufgegriffen wird. Deus tu conversus ist das Offertorium der Messe des zweiten Advents. Diese fünf­stimmige Vertonung stammt aus einem Offertorien-Zyklus, der in zwei Bänden in Rom kurz vor dem Tode Palestrinas im Jahre 1593 von Francis Coates herausgegeben wurde. In dieser Sammlung sind erstklassige, reife Werke anzutreffen, die eine besondere rhythmische Lebhaftigkeit vorweisen und harmonisch ungewöhnlich reichhaltig sind. Die Motette beginnt mit einer würdevollen Gottesanrufung, „Wende dich zu uns, o Herr“, und wechselt dann bei den Worten „und beflügle uns“ schnell zu Kaskaden von laufenden Sechzehnteln hinüber. Im nächsten Teil werden punktierte Figuren und lebhafte Rhythmen eingesetzt, um die Aussage „und dein Volk wird jubeln“ zu unter­streichen. Kurz darauf setzt jedoch eine homophone, langsamere und reuige Passage (dem entsprechenden Teil in Canite tuba sehr ähnlich) zu den Worten „Zeig uns deine Barmherzigkeit, o Herr“ ein, die gleichwohl bei „und gib uns deine Gnade“ zu einem sehr wirkungsvollen Ende kommt. Nach einem halben Takt Pause wird der gesamte Schlussteil wiederholt und die Motette endet auf diese Weise recht heiter. Hodie Christus natus est ist eine doppelchörige Motette (SSAB+ATTB), die aus Palestrinas dritten Motettenbuch stammt, das 1575 in Venedig erschien. Die Motette basiert auf dem Text der Magnifikat-Antiphon der zweiten Vesper des ersten Weihnachtsfeiertags und ist durchsetzt mit den traditionellen weihnachtlichen Rufen „noe, noe“. Es ist dies eine herrliche Komposition, die voller brillanter Kontraste ist: die unterschiedlichen Klangregister des hohen und tiefen Chors; die zunächst langsamen Passagen, Die die feierliche Ehrwürdigkeit der Geburt Christi ausdrücken und gegen die schnellen, antiphonischen, fröhlichen Rufe „noe, noe“ gesetzt sind; die laufenden Passagen, die den Gesang der Engel und den Jubel der Erzengel und der Gerechten repräsentieren und schließlich der Einsatz eines Dreiertakts, von dem erst bei den letzten fröhlichen „noes“ in der abschließenden Passage Gebrauch gemacht wird. Palestrinas doppelchörige Missa Hodie Christus natus est ist eine Parodiemesse, die auf der gerade beschriebenen Motette basiert. Es kommen hier alle oben genannten Kompositionstechniken vor, die der Motette einen so brillanten und bemerkenswerten Charakter verleihen. Während die Verwendung des musikalischen Materials der Motette in der Messe von Satz zu Satz variiert, ist die Motette in der Messe doch in allen Sätzen noch deutlich erkennbar. Das Kyrie beginnt mit einem wörtlichen Zitat (in dem die Sopranstimmen ausgetauscht werden) der ersten Takte der Motette, und ein großer Teil des „noe, noe“ Materials wird in leicht veränderter Form wiederverwertet. Anderswo wird das Material der Motette, das oft anhand der harmonischen Fortschreitungen erkennbar wird, teilweise in recht abgewandelter Form und zusammen mit neuem Material und teilweise mit nur kleinen Veränderungen verwendet. So zum Beispiel enden alle Sätze, mit der Ausnahme des Agnus Dei, mit dem fast ausgelassenen Dreiertakt des Motettenschlusses, der jeweils nur kaum verändert ist. Das Resultat ist eine eindrucksvolle Messe, in der die Klarheit, das Temperament und der Glanz ihres Vorbilds zusammen mit einer gewissen Weitläufigkeit und Grandezza dargestellt wird. O magnum mysterium ist eine Motette für die Geburt des Herrn, deren Text aus der ersten Hälfte des dritten und vierten Responsoriums der Matutin des ersten Weihnachtsfeiertags stammt. Sie stammt aus einer Motettensammlung für fünf, sechs und sieben Stimmen, die in Rom im Jahre 1569 publiziert wurde. In dieser exzellenten Motette wird die Ehrfurcht und die Freude der Hirten bei der Geburt Christi in einer Krippe ausgezeichnet nachempfunden. Die Musik beginnt mit einer Reihe von langsamen Akkorden, die „das große Geheimnis und das wunderbare Sakrament“ ankündigen, und fährt hauptsächlich homophon und mit verschiedenen und sehr gut kalkulierten Stimmkombinationen fort, bevor sie in einen lebhaften Dreiertakt übergeht, die den „Gott lobenden Engelschor“ repräsentiert. In der Schluss­passage erklingen mehrere Alleluias und die Musik wechselt zu einem Zweiertakt zurück: Die zweite Hälfte ist in ihrer Struktur der ersten sehr ähnlich und durch das Wiederverwerten einiger Melodieelemente der ersten Hälfte wird ein sehr guter Effekt erzielt. Tui sunt caeli ist das Offertorium der dritten Weihnachtsmesse (auch aus der Publikation von 1593). Diese fünfstimmige Motette ist quasi fugal angelegt, wobei kurze, homophone Interjektionen einen sehr wirksamen Kontrast zu dem vorherrschenden polyphonen Stil ergeben und den Schluss des Stücks sehr schön vorbereiten. O admirabile commercium ist eine fünfstimmige Motette für das Beschneidungsfest (das auf den 1. Januar fällt) und den siebten Tag nach der Geburt Christi. Der Text stammt aus der ersten Antiphon der zweiten Vesper dieses Fests. Die Motette stammt aus einer Sammlung mit dem Titel Florilegium sacrarum cantionum, die 1602 von Phalèse in Antwerpen herausgegeben wurde. Die ruhige und gelassene Musik der Anfangstakte—„O wunderbares Geschenk“—gibt die Stimmung für die gesamte Motette vor: Ein wunder­schönes und wohlbalanciertes Stück, in dem die hohe Cantusstimme zur Geltung kommt und langsam über den aktiveren Unterstimmen im Schlussteil entschwebt. Das Magnificat primi toni stammt aus dem dritten Magnifikat-Buch Palestrinas. Es ist dies wiederum, wie die meisten seiner Magnifikate, eine Alternatimskomposition, jedoch werden, was ungewöhn­lich ist, bis zu sechs Stimmen verlangt. Das Stück ist in seiner Anlage größtenteils polyphon und fugal und hat eine gehaltvolle Textur. Für Abwechslung sorgen verschiedene Kombinationen von hohen und tiefen Stimmen sowie stellenweise eine etwas schlichtere Textur. Vor und nach dem Magnifikat wird die homophone Antiphon „Hodie Christus natus est“ gesungen, auf der, wie oben ausgeführt, die doppelchörige Motette und Messe basieren.